Our comprehensive Fire Marshal Training course is designed to certify your business’s designated Fire Marshals (also known as Fire Wardens). Your team will learn how to prevent fires, how to use a fire extinguisher, and what to do if a fire breaks out. 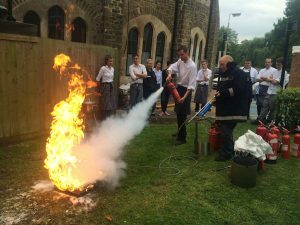 Our trainers have many years’ experience, and our chief trainer is an internationally recognised expert in his field with a distinguished career in the fire brigade behind him. He has advised fire protection teams as far away as the United States, Moscow & Azerbaijan. We make sure our courses are fun and interactive, as well as giving your team all the knowledge they need to help protect your business from fire. If you have 4 or more Fire Marshals in your business, then we can save you money by holding the training at your own business premises, or otherwise you can book single places on one of our public trainings. Who is the Fire Marshal training course for? If you would like us to come to your premises to train, just let us know. We cover London, Surrey, Berkshire, Hampshire – in fact the whole South-East (and sometimes further afield). We also run public fire marshal training courses if only one or two people need to attend. To discuss your training requirements, please get in touch with our friendly team on 0845 845 3001, or at info@surreyfire.co.uk – they’ll be happy to help.